Fresh water testing; aquarium; affluent treatment; soil & food testing; research laboratories; QC education, etc. 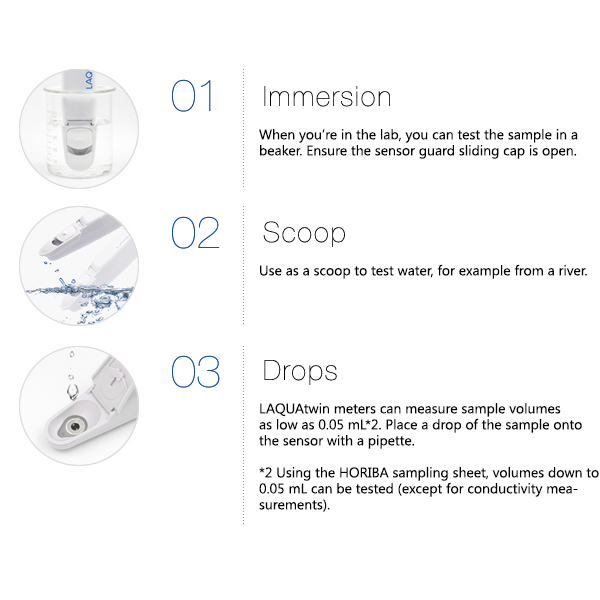 Get accurate direct measurement from a single drop of sample on the unique flat sensor—a result of 60 years of HORIBA’s sensor engineering technology. Select your LAQUAtwin from seven electrochemistry parameters such as pH, conductivity, various ions (Na+, K+, NO3-, Ca2+ ) and salt concentration that best suits your purpose. It’s simple & compact and is your lab-in-your-pocket. Use it wherever and whenever. 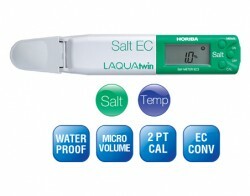 pH, conductivity, ions and salt concentration. 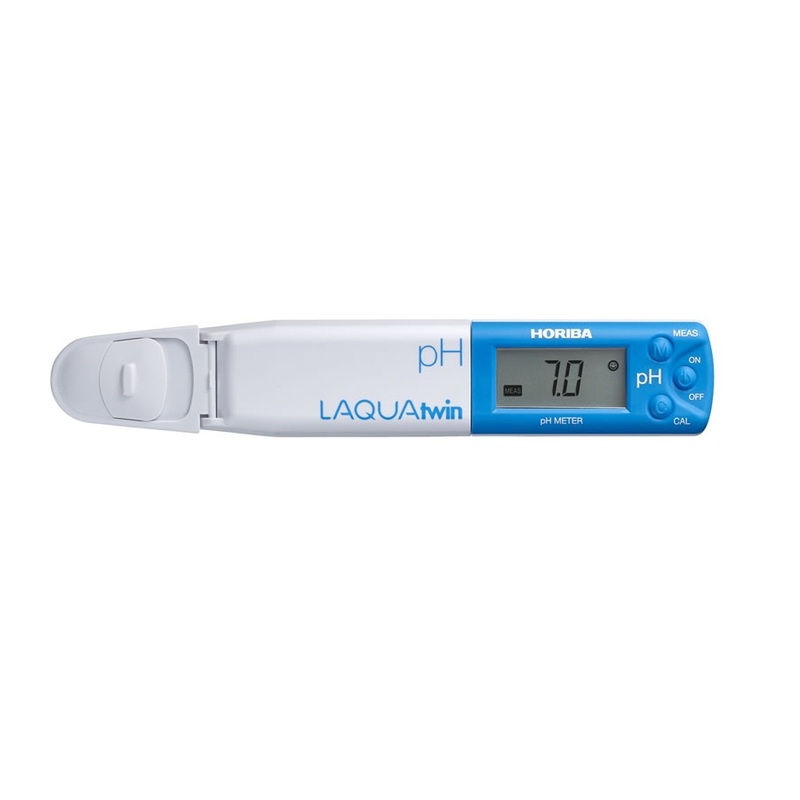 Seven water quality parameters are available to suit your requirement, such as pH, conductivity, ion concentration (Na +, K +, NO3 -, Ca 2+ ) and salt concentration. 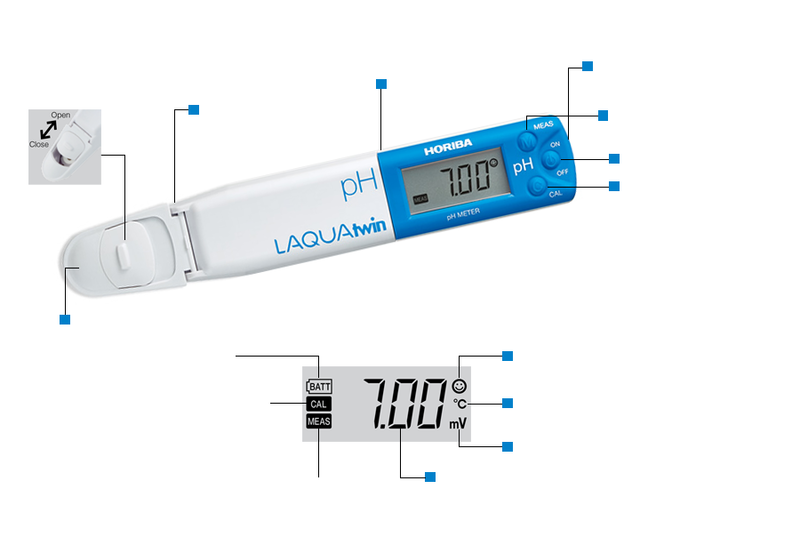 Incorporating the same principle as laboratory sensors, LAQUAtwin provides a reliable and accurate measurement. 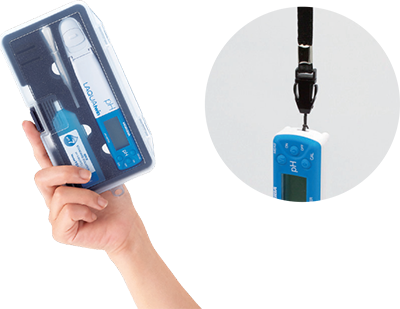 Easy operation for both the measurement and indispensable calibration procedure. Read the data once a smiley face lights up. 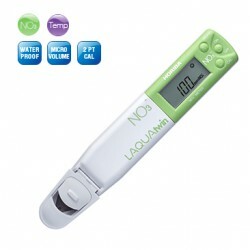 The meter and sensor are fully waterproof so you can take it anywhere anywhere. No worries when water splashes during measurement or cleaning. One meter provides seven flexible measurement techniques. 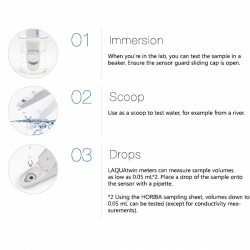 Simply choose the method that best fits your sample and situation. 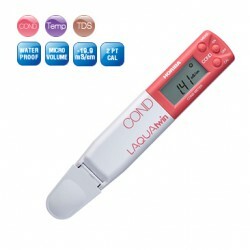 The compact carrying case contains everything you need for your measurements, including the standard solution. You can attach a strap or tag on the strap hole. 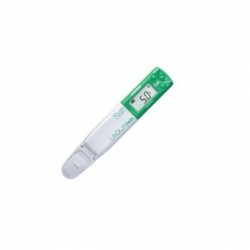 Drop a sample with a pipette; small volumes as 0.1 mL can be measured. Using sampling sheet B, volumes down to 0.05 mL can be tested. When you're in the lab, you can test the sample in a beaker. Ensure the sensor guard sliding cap is open. Use as a scoop to test water from a river. 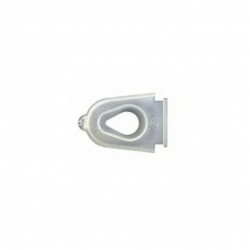 Vertical scoop is available with a unique sensor guard. 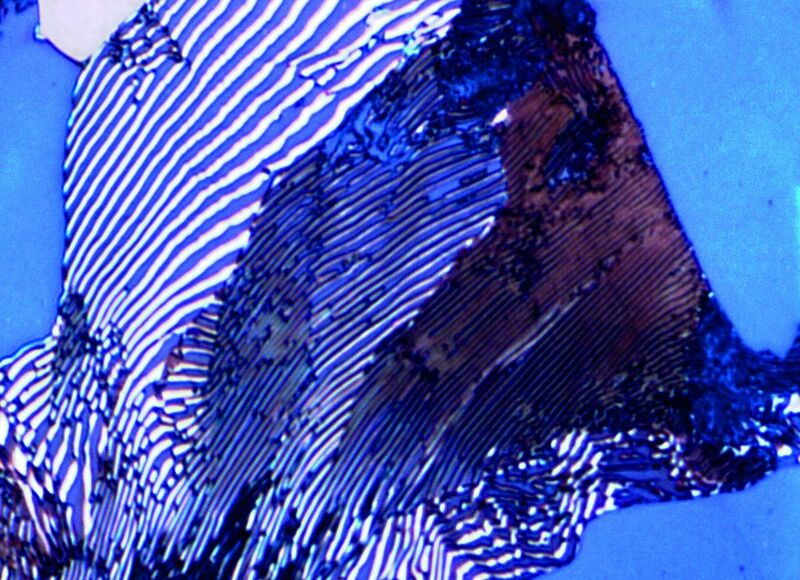 The sampling sheet allows tiny, trace volumes to be analysed. For example, wipe off the surface of the skin with a sampling sheet soaked with pure water and measure. Foods containing some moisture can be tested by placing a small piece directly onto the sensor. 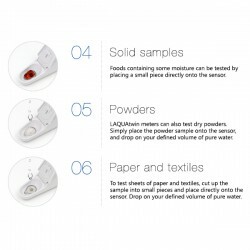 LAQUAtwin meters can also test dry powders. 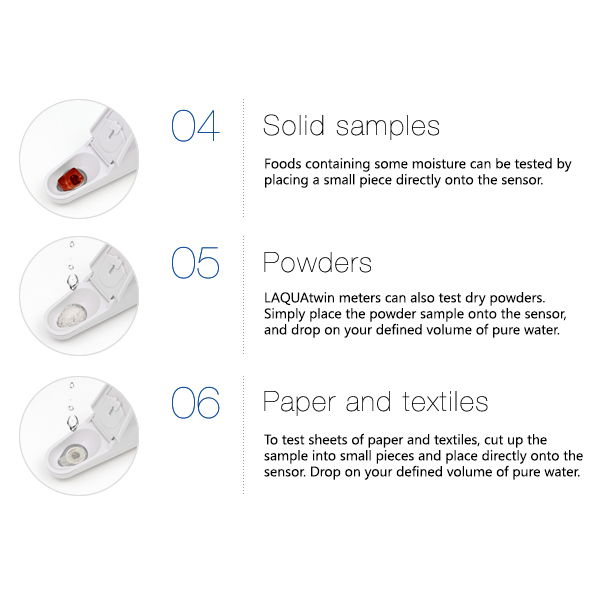 Simply place the powder sample onto the sensor, and add an appropriate amount of pure water. To test sheets of paper and textiles, cut up the sample into small pieces and place them directly onto the sensor then add a defined amount of pure water. 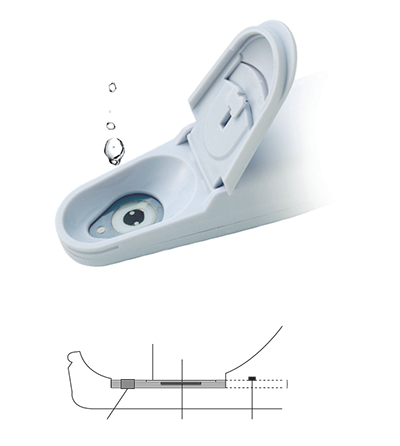 IP67 rated waterproof and dustproof. Sensor is easily replaceable. 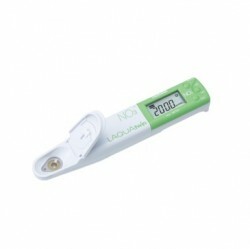 Strap hole Measurement button On/Off button Calibration button Sensor guard (light shield) Battery alarm Stability mark Temperature alarm Voltage measurement mode Measurement value Calibration mark Measurement mark Meter Sensor guard protects sensor. One meter, six methods *1. Only the LAQUAtwin range allows you to be this flexible! 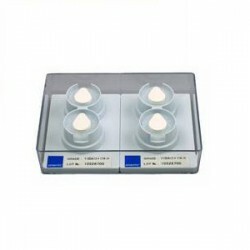 Choose the best method according to your sample, your situation and your needs. 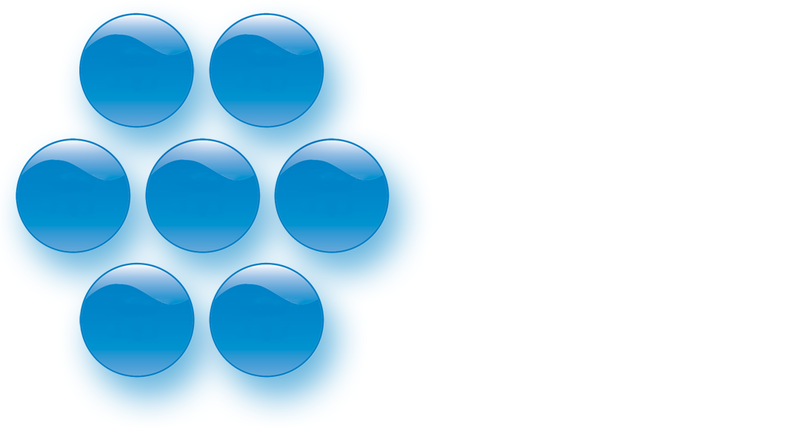 *1 B-771 (conductivity) cannot be tested in solids or powders. When you’re in the lab, you can test the sample in a beaker. Ensure the sensor guard sliding cap is open. Use as a scoop to test water, for example from a river. 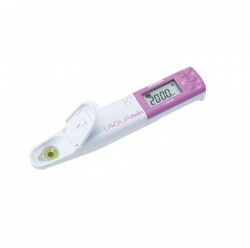 LAQUAtwin meters can measure sample volumes as low as 0.05 mL*2. Place a drop of the sample onto the sensor with a pipette. 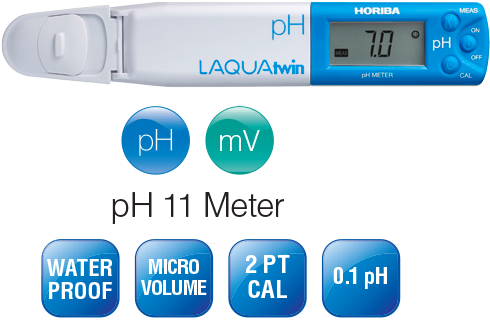 *2 Using the HORIBA sampling sheet, volumes down to 0.05 mL can be tested (except for conductivity measurements). 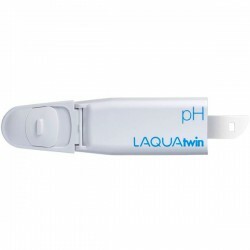 LAQUAtwin meters can also test dry powders. 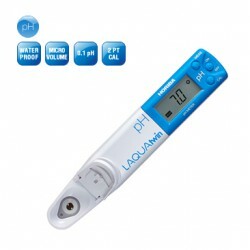 Simply place the powder sample onto the sensor, and drop on your defined volume of pure water. To test sheets of paper and textiles, cut up the sample into small pieces and place directly onto the sensor. Drop on your defined volume of pure water.